Whether deer season is open in your neck of the woods or it will be opening soon, you are probably thinking long and hard about treestand locations for the coming weeks. Food sources are perfect areas to focus your hunting efforts during early and late season, as during these times of year the bulk of deer movement is focused between bedding and food. Food sources could fit into any of the following categories: hard mast (acorns, pecans, chestnuts, etc. ), soft mast (persimmon, muscadines, black gum, etc. ), herbaceous forages (natural vegetation and food plots), woody browse (tree buds, leaves, twigs, and bark), or grains (food plots, crop fields, and supplemental feed). This article will focus on hunting oaks. 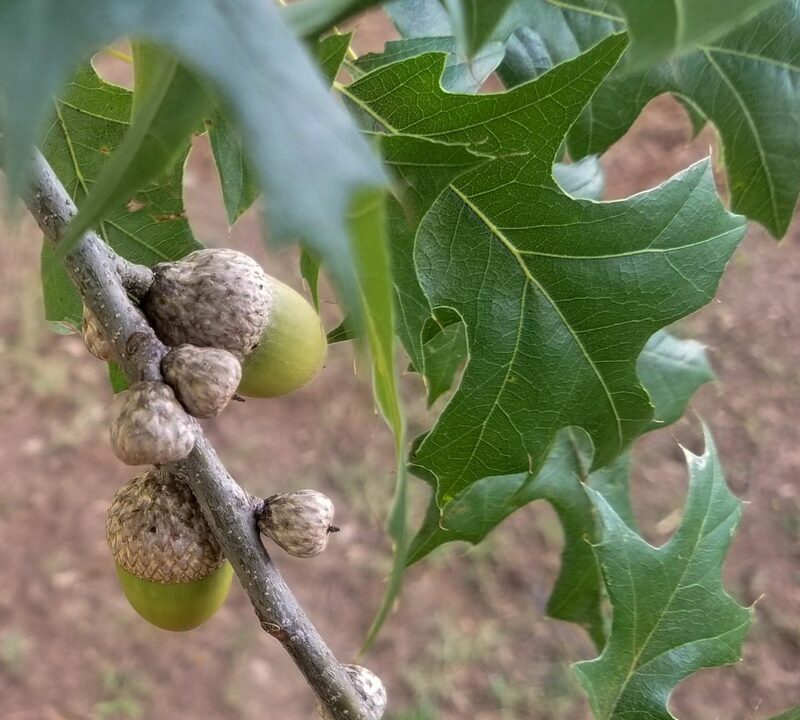 Many hunters already know that deer love oak trees, but few are actually able to positively identify different oak species and understand the timing of acorn fall, germination, and nutritional qualities that affect how deer use them. 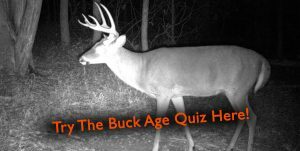 Below I will teach you how to identify 6 common oak species deer hunters need to know and give you a crash course on what you need to know to improve your oak hunting strategy. This is the popular guy on the block, as every white-tailed deer hunter has heard that white oaks are the holy grail of early-season hunting. 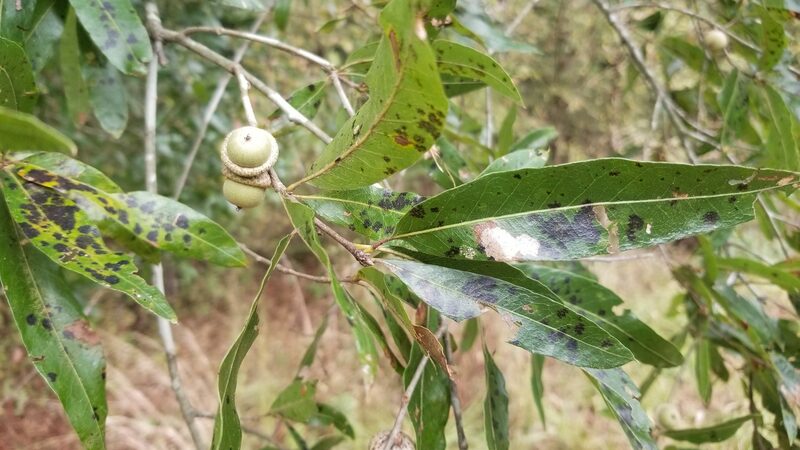 For the most part this is true, because white oak acorns have low tannin levels and high levels of carbohydrates making them highly desirable to deer. They do germinate as soon as they get enough soil moisture after falling to the ground, so the attraction is short lived. They key to hunting white oaks is finding them early. Before hitting the woods to scout, I like to identify areas on maps where I expect white oaks to be found. They are usually found from low-lying areas that are well drained and do not flood to dryer ridges. Once I have identified the suspected locations of white oaks, I will visit them in late summer and use binoculars to evaluate the canopies and make notes of which trees have acorns. I then check back periodically during the fall to see when trees are dropping. Most white oaks drop from mid-September to mid-October across the southeast. 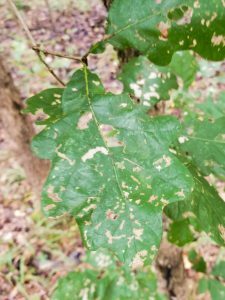 Find a white oak that is dropping acorns with a lot of deer sign under it and set up nearby for a great early season deer hunt! (Above) White oak has many large lobes along the perimeter of its leaf and drops large oblong acorns that are often green early in the season. 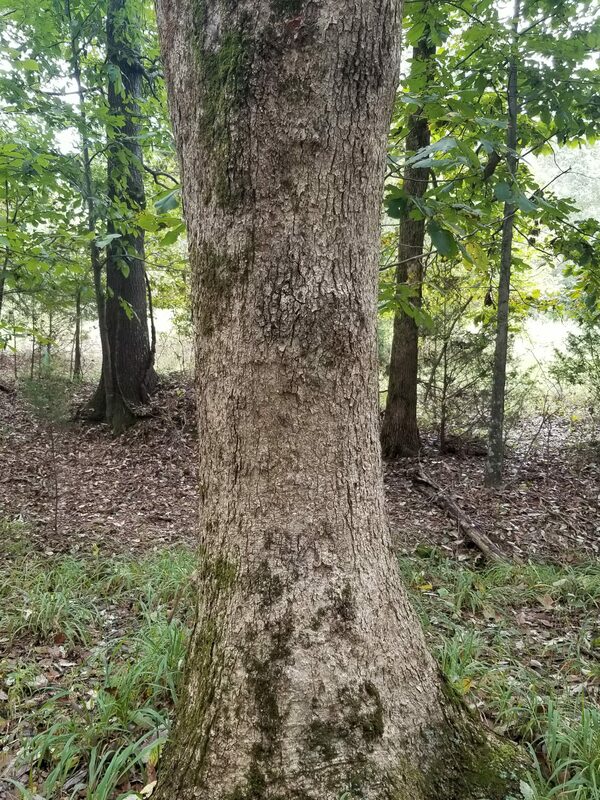 This bottomland oak tree, found across the southeast and along the Mississippi river valley, reportedly produces the most attractive acorn to white-tailed deer. You will not find this tree on ridges or dry areas and most often will find it in damp bottoms adjacent to wetlands. This oak has incredibly large acorns that are about the size of ping-pong balls. It is part of the white oak sub-genus, so it has very low amounts of tannins and high carbohydrate levels. Look for swamp chestnut oaks in hardwood bottoms along creeks, rivers, and wetlands. They have white-peelly bark that is characteristic of all white oaks and their leaves are broad with small lobes all along their edges. Like white oaks, I also locate which swamp chestnuts are holding acorns prior to hunting season and log them away as possible hunting locations for fall. 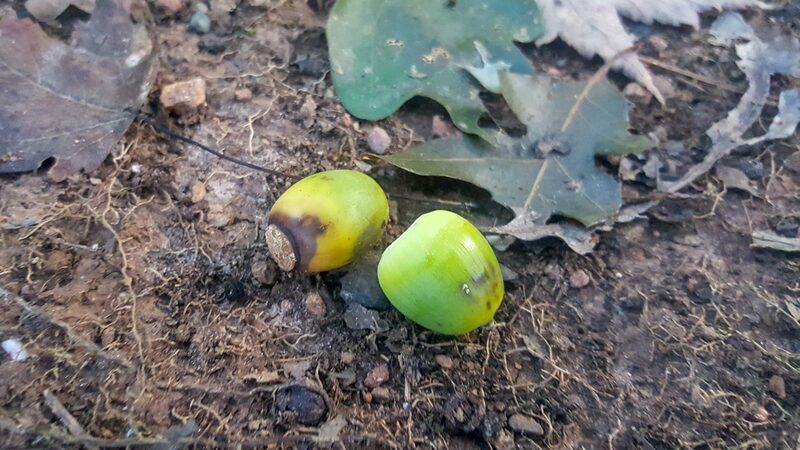 Make note that the bulk of swamp chestnut oaks usually drop acorns a few weeks after white oaks and will germinated as soon as they receive a soaking rain. 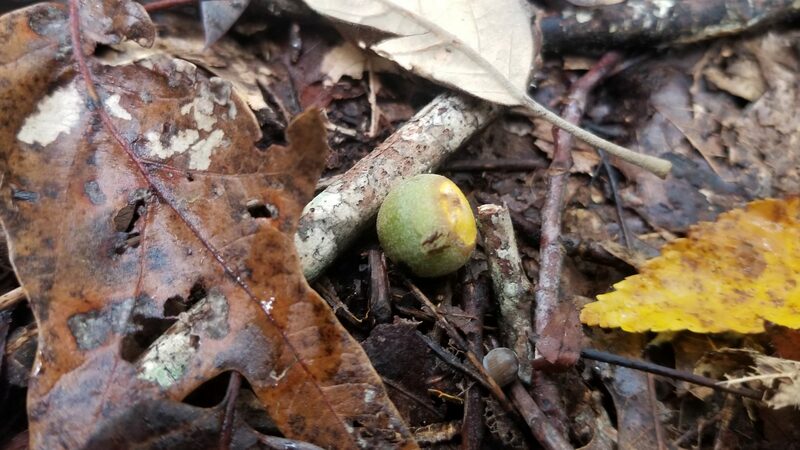 If you can find a secluded swamp chestnut oak that is dropping acorns, you have found a hotspot and should hunt it right away! 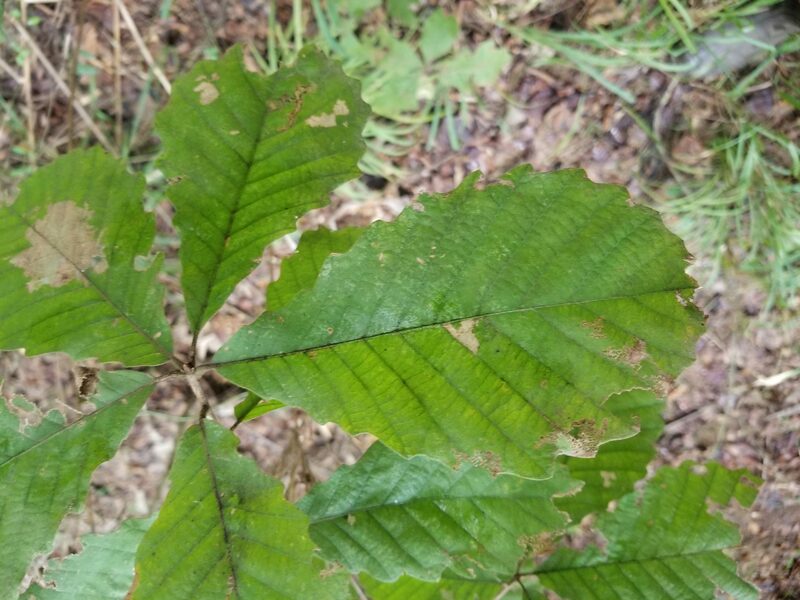 (Above) The leaves of swamp chestnut oak are very broad with very small lobes on the perimeter. The bark is light colored and flaky. (Above) Scarlet oaks have very deep pointed lobes with bristles on their tips and medium sized acorns. I have lumped upland red oaks together because of their similarities and the comparable hunting strategies associated with each of them. There are dozens of species that fit in this category; however, I will focus primarily on scarlet oak (Quercus coccinea) and southern red oak (Quercus falcata) because they are generally very abundant in upland hardwood stands. They are both found across the southeast from the upper coastal plain to the mountains in well-drained soils, ridge tops, and south facing slopes that can’t grow moisture loving trees. These are both members of the red oak group, so they have higher tannin levels than white oaks, making their acorns less attractive to deer than those from white oaks. However, hunting over red oaks can be extremely productive depending on timing and availability of other foods. All red oak acorns spend the winter lying on the ground and germinate in spring, making them a dynamite winter food source that is available long after white oaks have germinated. If white oaks don’t produce one fall, red oaks can be highly attractive early season; otherwise, I focus on them as a late-season food source. Since I am not generally focused on hunting these oaks until November or December, I do not put special emphasis on seeking them out prior to opening day. I simply keep my eye out for these red oaks dropping throughout the fall during my hunting exploits. Once the white oak acorns have germinated and are unavailable to deer I will re-visit these earlier noted trees and see what the deer sign looks like under them. You may just be surprised how attractive a stand of red oaks can be during late season when deer are seeking out the last available foods. (Above) The acorns of southern red oaks are small and very round. Their leaves have a bell-like shape at their base and an elongated leaf tip. (Above) While willow oak can be found on dry sites it is often associated with bottomland hardwood stands. It has long, linear, pointy leaves and small round acorns about the size of marbles. 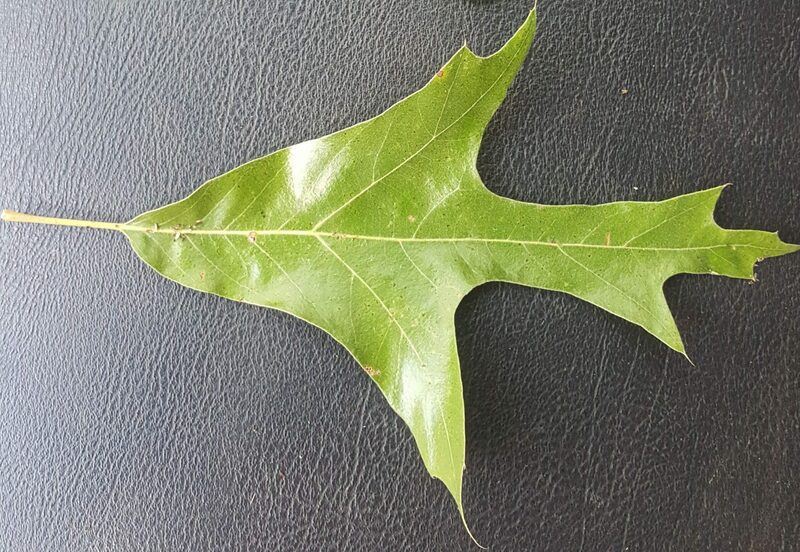 Again, there are several different bottomland red oak species, but I will only focus on willow oak (Quercus phellos) and water oak (Quercus nigra) in this article because they are so prevalent in the south. Like the red oaks discussed earlier, these acorns are high in tannin levels and are available all winter long. Keep your eye out for these oaks throughout the fall and make a mental note of those that have acorns under them. As season progresses all other food sources will fail and eventually these bottomland oaks will be devoured by hungry whitetails needing a lateseason energy boost. 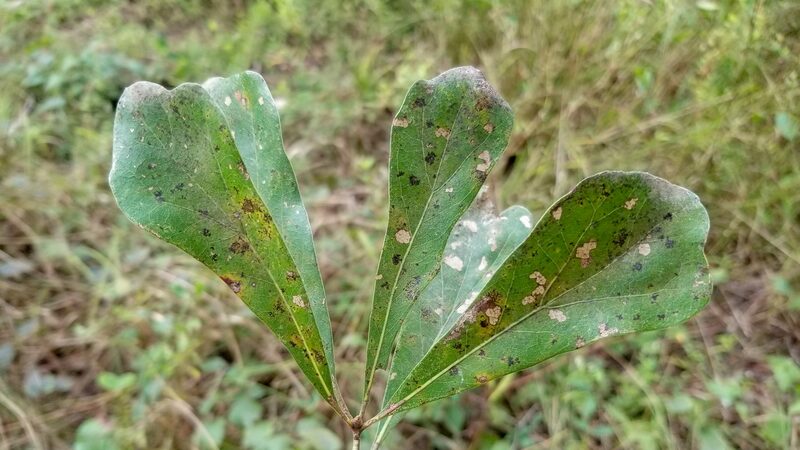 (Above) The leaves of water oak have a “spoon-like” shape with a broad leaf tip and narrow base. The acorns are very similar in size and shape to willow oak acorns. 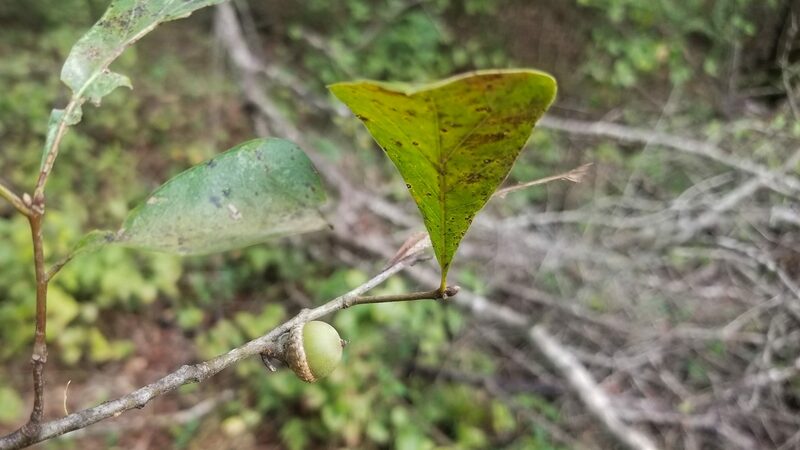 As was a common theme throughout this article, understanding the timing of acorn drop and germination is essential to hunting oaks while they are most attractive. Using this information will allow you to put together an oak hunting strategy for the opening of bow season through the last evening of late gun season. Now, get out there and find some oak trees!